While children in former Model C schools enjoy the privilege of excellent facilities, there are places of learning in rural areas without access to water, where pupils share grossly overcrowded classrooms, and where conditions essentially violate basic human rights. During a recent tour of these schools in the Eastern Cape, rights activists, academics and authors were completely shocked by what they saw. By MANDY DE WAAL. Anger, sadness and disgust – those were just some of the emotions that flooded a group of luminaries who toured Eastern Cape schools with Anglican Archbishop Thabo Makgoba, and who witnessed first-hand facilities at a high school in Mthatha. The particular spectacle that caused the horror was the toilets. “Some in the group nearly fainted when they saw the sanitation at Ngangelizwe High School,” Elinor Sisulu, who was part of the tour, told Daily Maverick. Makgoba and Sisulu were joined on the tour by Janet Love, Sindiwe Magona, Njabulo Ndebele, Lindiwe Mokate, Zakes Mda, Graeme Bloch and Pierre de Vos. The solidarity visits were organised by activist movement Equal Education, and included education academics Nic Spaull (University of Stellenbosch) and Kim Porteus (Nelson Mandela Institute), as well as education lawyer Cameron McConnachie. Equal Education’s General Secretary, Brad Brockman, told Daily Maverick that the delegates on the visit all have a history of social justice and human rights work, and that the lobbyists wanted the group to see and experience conditions in SA’s poorest schools – amenities that children and teachers must contend with every day. “Sindiwe Magona broke down after seeing the toilets at Nyangilizwe Senior Secondary School in Mthatha, and hearing and seeing girl learners at the school expose the pimples on their skin they have as a result of using the broken pit latrine toilets smeared with faeces,” Brockman said. “All of the delegates were deeply affected by what they saw,” he added. “Visiting Samson Senior Primary, a mud school in Libode, Zakes Mda asked why 50 years after he himself had attended school in the rural Eastern Cape, there were still children going to school under these conditions,” said Brockman. Sisulu was struck by the lack of textbooks and reading materials in all the schools toured, while Bloch asked officials from the Department of Basic Education present during the visits why children were being taught in class to wash their hands after using the toilet, when there were no hand basins or soap in many of the schools visited. Seeing SA’s school facilities crisis was a seminal experience for the people on the tour – who are now sharing their thoughts publicly during talks, on Twitter, on Facebook and other social media. The reach and the influence of this group means that a very public, global spotlight is being thrown on the local education crisis. “It will take me long time to recover from the heart-wrenching experience of #SolidarityVisit. Until something is done I must not recover,” tweeted Mda, who flew out from the US, where he teaches creative writing at Ohio University. De Vos, the Claude Leon Foundation Chair in Constitutional Governance at the University of Cape Town, drew attention to the problem of overcrowding in one of his tweets: “#solidarityvisit At Ntapane Secondary School. 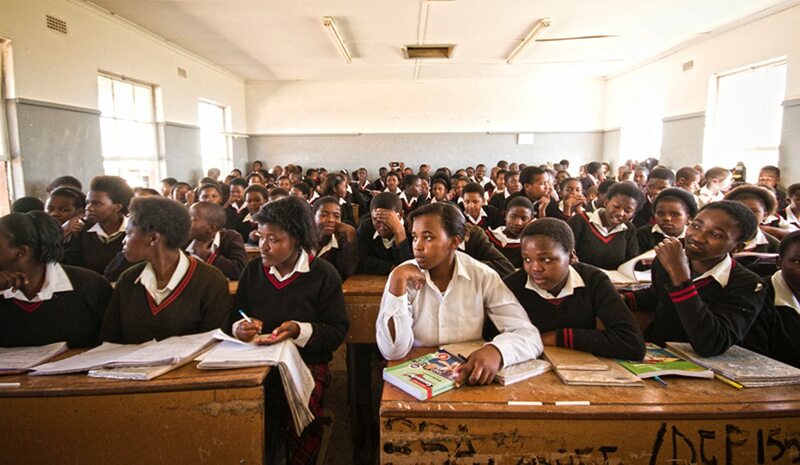 Pic shows 135 learners in grade 9 class,” and in his Daily Maverick column. Formerly schools that were reserved for white pupils during the Apartheid era, Model C institutions benefited significantly from hugely biased infrastructural spending before democracy. In her book The Right to Learn (written in the 80’s) the director of UCT’s School of Education, Pam Christie, detailed the disparity in education spending at that time. In 1982 the Apartheid government spent R146 (on average) educating a black child, but invested R1,211 on a white child. The legacy of this is a government education system that has inherited two classes of schools. Beacons of privilege, Model C schools have good infrastructure where students (regardless of race) enjoy much better odds of passing matric, according to research. And then there are schools like those toured during Equal Education’s ‘solidarity visit’ that don’t even have perfunctory requirements that would make them compliant with basic human rights. The Samson Senior Primary School in Libode, some 40km outside of Mthatha, currently doesn’t have any water tanks because these were destroyed by a storm: if a student needs water they have to walk about five kilometres to the nearest tap. Here children are taught in two mud huts. There used to be four mud huts, but two of them collapsed. The remaining huts are structurally unsound, bitterly cold in winter and unbearably hot in summer. Equal Education organised the tour to draw attention to the conditions that learners and teachers must endure in rural schools in the Eastern Cape and across the country, and to highlight schools where SA’s prevailing schools infrastructure crisis is at its worst.